The British Iaido Association is proud to announce that after long talks with Teruhisa Nanno sensei he has agreed to send to us his manual “Iai–Do Japanese Sword Drawing Techniques and Spiritual Training”. This manual is a must for all students of MJER, it is an in–depth look at all the forms and together with the DVD makes for an excellent reference point not only for ZNIR students but all students of Iaido. The manuals are as per the original in both Japanese and English, but it is a limited supply and will be sold on a first come basis, so to avoid disappointment order yours now! 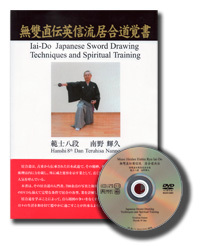 Buy Teruhisa Nanno Sensei’s Book “Iai–Do Japanese Sword Drawing Techniques and Spiritual Training”. Read more about the British Iaido Association Chairman Paul Chadburn in this short biography.